It’s something that’s been long overdue. I think it’s unfortunate that we needed to have a federal mandate to do it, but it’s better than not getting it done at all. I’m very supportive of that entire initiative, and I think we’re just on the verge of some major breakthroughs. The focus, particularly here in an academic medical center, is to work much closer with the physicians. That’s the piece that I really enjoy… that’s where the big opportunities are. We can’t confuse the willingness to change — which I think is very high — with the ability to change and the ability for organizations to be able to absorb that amount of change. I would just like them to come out with a standard and start by making it voluntary at first and see if people bite. I don’t think there will be much resistance to it at all. I think people will sign up like crazy. Look at what they do with Facebook. We have this “co-opetition” here in Salt Lake City, and it’s really great to have a guy like him here in town to bounce ideas off. He has just been phenomenal in terms of representing the industry from the hospital side of things. Gamble: I wanted to ask what made you decide to go into the academic environment — a lot of things you’ve just talked about kind of make that click, I think. Turnbull: I started my career up in Canada, and I’ve always thought of that as kind of a fortuitous thing in terms of my IT career. In Canada you don’t have a big focus on patient accounting systems, because you don’t need one — it’s a single payer. I was in a 400-bed hospital up there, and we had one and a half people in patient accounting. The first hospital I worked at in the United States was about the same size, and they had 70 people. It’s a very different ballgame. And so up there, our focus in IT was on clinical systems. That’s really what I wanted to get back to career-wise, but it seems like almost every place I’ve gone to in the United States, we’ve ended up having to put in a new revenue cycle application — including here. Now we’re focusing on the clinical side. Quite frankly, I’m delighted with the whole push on the Meaningful Use side. I think it’s something that’s been long overdue. I think it’s unfortunate that we needed to have a federal mandate to do it, but it’s better than not getting it done at all. I’m very supportive of that entire initiative, and I think we’re just on the verge of some major breakthroughs. I wish I was going to work another decade — I’m not going to, but I think we’re going to see some dramatic improvements in the way we deliver care and start driving down costs. For us, we have this big initiative called value-driven outcomes, and it’s all about trying to eliminate variation here in our healthcare system and driving costs out of it. It’s a very physician-driven initiative now that they have the data to study their variation, so it’s been an exciting project over the last year or so. Gamble: Looking back at your career, since you first had your first CIO role, obviously a lot has changed, and I think it must have been really interesting to be a part of an industry that has changed so drastically and to play a role in that transformation. Can you just kind of give me some of your thoughts about how the role of the CIO has evolved? Turnbull: That’s a very big question. Gamble: It is. I apologize. Turnbull: When I look back, the first time I ever got engaged in IT was with a couple of large, 1,000-bed hospitals up in Canada. We were installing Meditech applications. That was back in the late 70s. You sort of felt like you were experimenting a bit and you were making major changes, basically going from paper to electronic solutions at that point in time. Now, I think from a tactical point of view, we tend to be moving from one electronic solution to hopefully a better electronic solution. Organizations have become much more tightly integrated; you’re seeing the ambulatory side being much more integrated with the inpatient side. So the world is changing a little bit there operationally in terms of how we function. I think that’s one piece that I’ve certainly experienced in the last two organizations that I’ve worked for. I think the big piece is a shift to really using data to manage, and a part of that is the electronic medical record side of things. But I think the other side is the business intelligence tools. We finally have some great products out there that the end-user departments can access better and do a lot of their own reporting and analytics. They’re becoming a bit more independent, and I think the pressure is off of IT to support those end-user departments so heavily. The focus, particularly here in an academic medical center, is to work much closer with the physicians. That’s the piece that I really enjoy. It seems like it took a long time for me to get here from a career perspective, but I think that’s where the big opportunities are. Get the brightest people in the organization really engaged in using the information. I think that’s the next big trend, and that’s where the big opportunity is right now. Gamble: It’s a really interesting time for this industry, and I think that sometimes it’s important to stop and just kind of reflect and realize that we’re lucky to be part of it right now. Turnbull: Yes. The thing I’m so pleased to hear is that I believe they’re going to push the phase 3 of Meaningful Use back by a year or so. The reason I say that is because I think we can’t confuse the willingness to change — which I think is very high — with the ability to change and the ability for organizations to be able to absorb that amount of change. I think pushing phase 3 back a year or so isn’t going to hurt us too much. We just need to be careful that we don’t push too hard and lose the gains that we’ve made. Gamble: I agree with what you said about willingness and the ability to change. Almost everyone agrees that everything in phase 3 needs to happen, but going there too quickly is something that could really impede some of the progress that’s been made. Turnbull: My friend across town, Marc Probst, who is the CIO at Intermountain Healthcare, has been very actively involved at the federal level with the committees and the Office of the National Coordinator. And he’s been beating the drum pretty hard to focus on developing standards. I think his message is finally being heard, and that’s another step we need to take as we head into the phase 3 world and beyond. I’m hoping that the traction he’s been able to gain there won’t get lost, because it’s really key. I’m really hoping that we will get a unique patient identifier in this industry, because that’s going to go a long way to allowing us to share data and provide safer care. Gamble: It’s an intriguing thing. When you think about how much easier that would make things for patients and for clinicians, it’s pretty amazing. Turnbull: I would just like them to come out with a standard and start by making it voluntary at first and see if people bite. I don’t think there will be much resistance to it at all. I think people will sign up like crazy. Look at what they do with Facebook. Gamble: Exactly. So much of the information is already out there. Gamble: I’m familiar with Marc Probst. He’s one of the CIOs who’s very involved and engaged in advocacy and things like that. I have a lot of respect for that kind of dedication, because it just seems like there’s so much on the plate of CIOs right now that it can’t be easy to take the time to be involved in CHIME and be involved with government and things like that. So those who are able to do it — that effort adds so much. Turnbull: It sure does. I’m so proud of Marc for all that he’s done. We have this “co-opetition” here in Salt Lake City, and it’s really great to have a guy like him here in town to bounce ideas off. He has just been phenomenal in terms of representing the industry from the hospital side of things. I don’t know where he gets the energy, but he’s doing a super job. And there are many others across the country doing that as well. I don’t know where they find the time. I guess you just got to depend on having some great staff back home. Gamble: Yeah, sure. 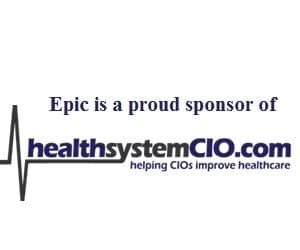 I didn’t want to forget to of course congratulate you on being named CHIME/HIMSS CIO of the year. That’s a really great achievement, and I can imagine something that you’re very proud of. Turnbull: Yeah, it was quite a surprise and quite a nice way to start the year. It’s one of those things you don’t expect. It’s not like you go and apply for it. It was really a lot of fun to receive the recognition. It helped to reestablish some old contacts — people that I hadn’t seen in some cases in decades, so that’s been a really special part of it too. It’s really meant a lot to us here at the University of Utah and we’ve had a chance to celebrate it. It’s given us another opportunity to put the university back on the national map. It’s been fun. The event in New Orleans was just a blast. We really had a great time there. A lot of my staff came down for it, so lots of good things come out of it. Gamble: I can see that it really helped to get recognition for your team and for the organization and to put them on the map as well. Turnbull: I’ve had a chance to work with some pretty neat people over the years and have been very privileged to do so. It’s been a fun ride here for the last couple of months. Gamble: I imagine. How did you actually find out — was it a phone call or email? Turnbull: It’s kind of funny. I got a call from Rich Correll, who you probably know was the CEO of CHIME. We’ve been friends for a long time. I was actually sitting on the beach in Mexico having a margarita when he called. We’ve always kibitzed with each other over the years and given each other a hard time, and so I thought he was kidding. I thought he’d phoned my executive assistant and found out that I was in Mexico so he thought he’d give me a call just to shake me up a bit. So it took him quite a while to convince me he was serious. Gamble: That’s funny. I’m impressed that you took a call while you were on the beach. Turnbull: Yeah, I wondered about that myself. Anyway, it was good talking to him, and it was sure a pleasant surprise. Gamble: All right, well, we’ve had a chance to talk about a lot of different things. I really appreciate your time. Unless there’s anything else that you wanted to talk about I just wanted to thank you again for taking the time to speak with us. Turnbull: No problem, Kate. It was a pleasure. I’m happy to take a call anytime. If you have any questions you’d like to bounce off, please feel free to give me a call. Gamble: I will, thanks. And I will stay tuned to your organization and see what you guys have in store in the next couple of months. Turnbull: Yes, it should be interesting. We’re looking forward to a couple of these announcements, but as you can imagine they’re very, very tightly held at this point in time. Gamble: All right, well thank you again for your time, and best of luck.